Sweet Friends, Sweet Treats & Sweet Angels! Bags & Beautiful Bloggy Buddies!! The Dog Sat On The Tuckerbox! Warm Toes, Warm Tummy & Warm Heart!! There've been two types of storms brewing here today - firstly, we had lots of ominous looking clouds build up throughout the day and we thought we might get some good rain from it ... then it kind of spitted and spotted a bit then went away again. On the bright side, I did get my washing dry! Tee! Hee! Hee! AND the best part of this for me, was that the brewing storm pushed our temperatures up a little - YAY!! The last couple of days have been wonderfully warm - obviously the weather is practicing for tomorrow's first day of Spring!! Now ... the second storm ... I've been SEWING up a storm!! Well, a bag, actually! 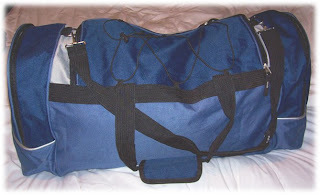 Tomorrow is the start of the posting part of Linda's Bag/Bucket Swap and while I had the stitchery finished a while ago, and found just the right fabrics a week or so ago ... the cold weather had kept me from being very motivated to venture into the ice-box sewing room. So, after being a good girl and popping in a couple of loads of washing today, I hit the sewing room to stitch up my storm ... errr ... BAG! Want some sneaky peeks??? Oooooooh! Pretty fabrics, lovely lace ... what else can we spy?? A pretty pearl button! Don't mind the pin holding it in place - I told you I've ALMOST finished! 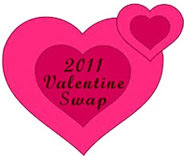 Of course, I've also got a few more sneaky surprises to go IN the bag before I post it to ... my secret swap partner!! Aha! You thought I was going to slip up and tell you, didn't you? NOPE! You'll just have to wait until I've posted it and it's arrived in ... a far away land!! Tee! Hee! Hee! I'm pretty sure the recipient doesn't visit my blog, but just in case, I'll say no more, except that I'm looking forward to seeing a hand-made work of art arrive in my very own mail box from my sneaky swap partner. Following a few clues, I've got three bloggers who are 'suspects', so it will be fun to see if I'm right - will keep you posted! The other thing I did today was to drag my beloved Geek Boy along to see "Mama Mia". Now, I think I was probably Australia's youngest ABBA fan, as my family tells stories of me singing along with Anna, Freda, Benny and Bjorn from the time I was about five. I had T-shirts, albums, posters and still have a scrapbook someone put together as a birthday present for me that's just FULL of ABBA paraphernalia. Plus, I still love the music - it's just so catchy and contagious!! I REALLY wanted to see the stage production of "Mama Mia" but timing and budgets didn't allow, so DEFINITELY wanted to see the movie - and wasn't at ALL disappointed - I LOVED IT!! I'm not usually a 'Chick Flick' kind of chick, but combine the music of ABBA, gorgeous scenery and Pierce Brosnan and you really can't go wrong! Even GB had to admit it was an entertaining way to spend the afternoon. I have to say, though, I NEVER thought I'd see the very macho Pierce Brosnan wearing 70's glam rock gear - quite a change from the super suave 007! Tee! Hee! Hee! If you grew up in the 70's/80's - and appreciate a hunky blue-eyed Pierce!! - make sure you see "Mama Mia"!! Right now, however, I'm rather weary from weathering my stitching storm etc, so I think I'm off to keep a date with my pillow - Bear Hugs! Here I am, taking a leaf out of Snoopy's book, and doing a HAPPY DANCE!!! OK, don't picture that, cos it may give you nightmares! Tee! Hee! Hee! Why am I doing a happy dance, I hear you ask? (Or not, if you're still hung up on that disturbing mental picture of me happy dancing!!!) 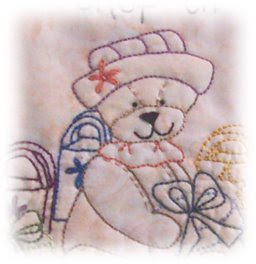 Well, I got stuck in and wrote the instructions for the Angel Bears pattern - YAY!!! So ... now all I have to do is scan the stitchery designs and give them a little tidy-up in Photoshop, take a photo of the two hangings together for the cover, then print the whole kit and caboodle. 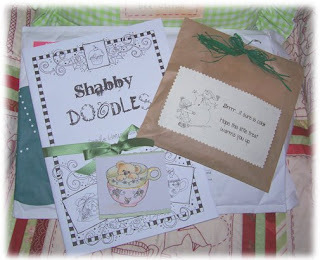 (And just what IS a kit and caboodle?!?! Hmmm ... note to self - early to bed tonight!!) And THEN ... there will be a give away, so make sure you watch this space! And now, since I've exhausted myself with my happy dance, I'm off to enjoy a hot shower before I crawl into bed to catch on that sleep that I'm obviously deprived of at the moment!! Tee! Hee! Hee! Til next time - SKIPPITTY, HOPPITTY, SHUFFLE, SHUFFLE, BOOTIE SHAKE!! Bear Hugs!! Now in the wake of the calamity, I received a lovely call from one sweet bloggy friend who must've been reading the post about five seconds after I put it up! Bek of Bek's Shabby Dreams (who also lives in Toowoomba) phoned to offer commiserations and to invite me to visit her to choose a couple of her faux cupcakes to fill the void - What a SWEETIE!! Now, Bek and I have actually been trying to catch up with one another ever since we discovered there were two shabby chic/country/cupcake fans blogging in Toowoomba, but we've not been able to match busy schedules until now, so off I trotted. 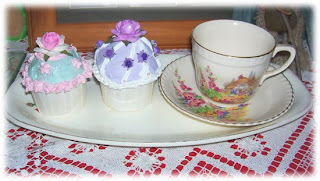 We had a lovely visit and I admired the cupcake-bedecked sunroom at Bek's place where she has her faux goodies displayed (which she sells on eBay and through her blog) and her three kids helped me pick out a couple of pretties to display with my tea cups. Thanks so much, Bek!! It was a lovely and unexpected gesture and the cupcakes look right at home on my coffee table, don't you think? Aren't they sweet? So ... 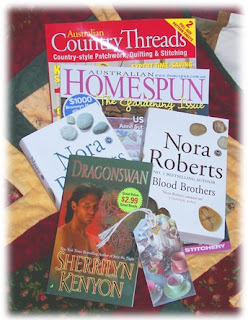 I have new pretties, a newly met-in-person bloggy friend and GB did some chores around the house to get back in the good-books. All in all, a day that started badly, turned out rather nicely! 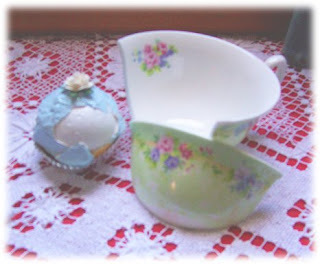 The only problem now is, there are TWO blogs of cupcakes to drool over - Bek's and Kerryanne's!! Oh dear! BUT, I maintain these sweeties are still better for me than the real thing - no calories!! Tee! Hee! Hee! This one is the 'boy' version. I wasn't sure about this fabric when I bought it, but it has really grown on me and now I'm wishing I'd bought more - isn't that always the way!! The pattern will include the outline and colour charts for both versions, making it a handy one to have on hand for the arrival of nieces and nephews (the two 'angels' mentioned in these samples! 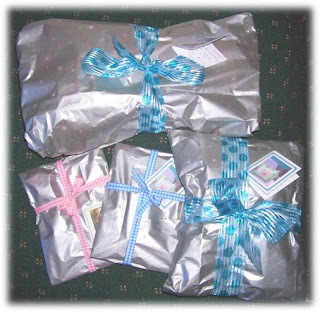 ), christening gifts, even birthday gifts for slightly older children, as their birthday will always be the same!! They'd also make great door hangers ... or library bags ... or quilt panels ... or ...!!! Soooo many ideas, so little time and play money! Tee! Hee! Hee! Of course, the BAD news about finishing these samples is that I've run out of excuses to avoid writing the instructions - GROAN!! It really is my least favourite part of the whole designing process, though I've been a little encouraged to find other designers like Natalie Ross of Natalie Ross In Stitches, Melly of Melly & Me, even my inspirational and highly organised buddy Kerryanne! all dread the instruction writing phase of a new design. I'm sure it's because basically crafters are 'doers', no matter what their chosen craft is, so that's what we'd rather be 'doing' instead of sitting still and writing and ... THINKING!!! 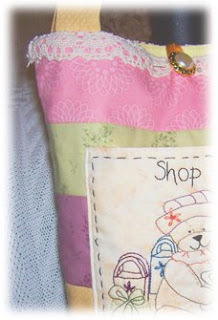 Still, once the instructions are written and the patterns printed ... there will be a give-away!! So watch this space!! 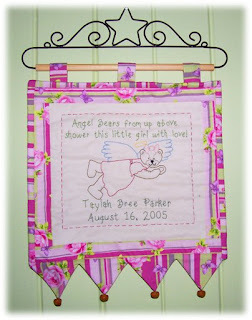 Speaking of giving away patterns, today is the second Monday of the Stitchers Angel pattern swap at Hugs From Helen. This week's designer is Natalie at Cinderberry Stitches and she's designed a pretty little bag (Attention all you bag-swappers out there!!) which features blue wrens. Make sure you pop over to Helen's Blog and check back in each Monday for the next five weeks (seven all up!) 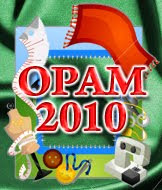 to collect these fantastic FREE project patterns. Oh boy! That "To Do" list just groaned as a new item was added! Tee! Hee! Hee! 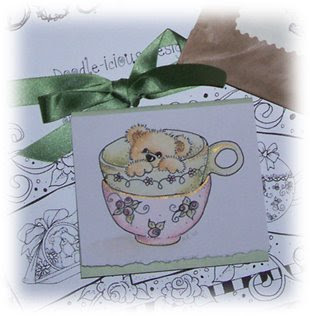 Well, I think that's about it from the home of Tag Along Teddies today, which means I've stalled as long as I can on the instruction-writing task, so I'd best go make a start ... or maybe I'll just go have a nice cup of tea instead and catch up on a few more blogs!! Oh! For a fun (and VERY sensible!) 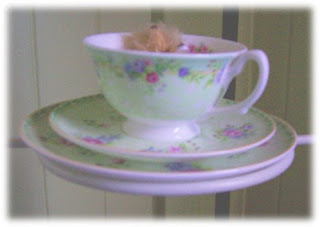 suggestion on lifestyle guidelines, pop in to Kerryanne's blog to check out her latest post - very funny, yet very zen! Tee! Hee! Hee! Til next time - Bear Hugs! Yes, calamity struck our lounge room this morning in the form of "The Handyman"!! You see, I have a little table full of treasures (almost a shrine to the talent of Kerryanne English!! Tee! Hee! Hee!) 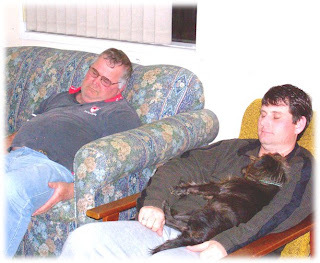 in the lounge room. That's the start of the story. Now, in winter, the only place for the gas heater to sit is in FRONT of this little table. So far ... no dramas. In fact, it's sat there for the past two winters and there haven't been any problems - until today!! After a warm couple of days, today dawned cold and blustery - AGAIN!! - so we turned the heater on. Uh oh! Heat works, fan doesn't! So ... "Handyman" (AKA my Geek Boy who's not quite so beloved this morning!!) decides to fix it. OK, not a problem, he's actually pretty good at the whole fix-it scene. Just one small (read: HUGE!!) problem - he didn't think to move said heater AWAY from the table full of breakables!! I'm pretty sure I don't have to paint you a picture! The result?? The poor little bear was actually in the broken cup when it toppled, so he's a bit traumatised and is now resting in one of the remaining intact cups, wishing someone had slipped a little whiskey into the tea!! I suppose I should be thankful that there wasn't more damage and after initially being very defensive and telling me it was all my fault for putting things too close to the edge (silly me to not foresee a scenario that involved banging and kicking of the heater and thus the bumping of my table!!!) GB was very sorry. I know they're only 'things' but they are things that have come from friends, so that imbues them with a little bit of magic and lots of semi-mental value. Plus ... I'm a GIRL and I reserve the right to cry over things that a man might see as trivial!! So there!! So ... not a great way to start the morning, especially since it really is quite nasty and cold and the heater isn't working properly (yep, all that banging and damage didn't make any difference!!) Perhaps I'll just crawl back into bed with a book and come out again tomorrow!!! Hope you're day is a little less traumatic!! Bear Hugs! It's been a funny sort of day today, weather wise. I got up and it was sunny, so I popped a load of sheets into the washing machine, with the thought that by the time I'd enjoyed a leisurely breakfast, it would be time to hang them out. Well, 15 minutes later, as I sipped my morning brew, I heard a peculiar noise ... which got louder and heavier ... OK, where did that rain come from?!! I looked out my window and the sun had been replaced by dark clouds, which of course, is where the rain was coming from! Drat!! So, into the dryer with the towels, so much for reducing my carbon footprint!! 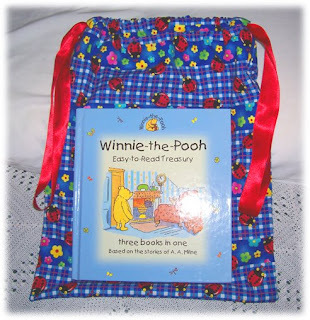 It's a book bag for one of our nieces for her birthday last week - oops! Late again!! 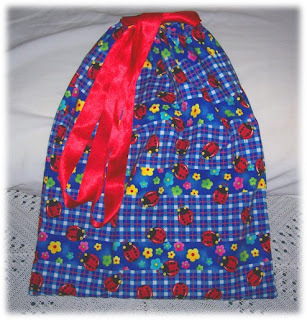 I fell in love with the ladybird fabric - it's just so funky and bright and cheerful, perfect for a 3 year old's book bag. And what is inside this eye-catching bag? Silly old bear!! It's Winnie the Pooh - the original type illustrations, before Disney messed with it. I love Winnie the Pooh stories, they're just so much fun, but also show the value of friendship. Wonderful!! Aren't the colours pretty? 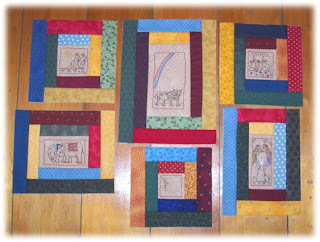 I tried to get a little creative to show these off, hence the triangles, although now that I look at it, it would be a pretty pattern for a patchwork project ... hmmmmmmm........ Just kidding - for now! Too many things on the "To Do" list already. So that bag is on the weekend's agenda of projects to tackle. Will keep you updated. Isn't she GORGEOUS!! And all snugly warm to face Melbourne's chills - she and I sympathise with each other over coping with the cold!! I borrowed the photo from Kerryanne and she said it's a bit blurry cos she was in a hurry, but I think it's cos she goes everywhere at the speed of light and like a superhero, you can never quite get a clear picture! Tee! Hee! Hee! Now, last weekend, Kerryanne very kindly awarded me the Wylde Woman Award - which made me a little teary and a little blush-worthy, but also very chuffed!! 2. 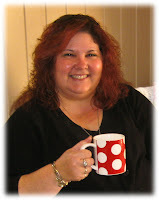 Link back to this blog site http://www.tammyvitale.com// so Tammy can go visit all these wonderful women and remember the Purpose of the Award: "To send love and acknowledgment to women who brighten your day, teach you new things and live their lives fully with generosity and joy." How flattering to be told by someone I admire that I brighten her day!! When I first began blogging, it was a bit of an experiment (not knowing much about WHAT blogging really was!) 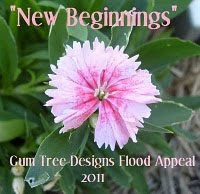 to see if it brought more visitors to my business web site. It was Kerryanne's blog that inspired me to 'give it a go' eventually, but she was also the most encouraging friend and mentor along the way, for my designing as well as blogging. 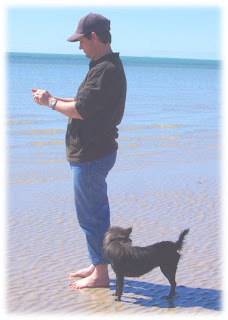 And through our toing and froing, we've become blogging buddies - how wonderful!! So, my response to choosing Wylde Woman Awardees would be - right back at ya, Kerryanne! And my second nominee would have been Lilly Linda of Lilly Cottage - but Kerryanne stole my thunder there, so I can only say that great minds think alike!! So then I started thinking about blogging buddies who brighten my day, teach me new things and live their lives fully with generosity and joy. Hmmm ... that would be ALL my blogging buddies!!! But I decided to mention three especially. The first is Natalie Ross of In Stitches - Nat has shared a few of her roller-coaster ride downs as well as the ups and has definitely been hit with some challenging situations in her life - but what I love about Nat is her sense of humour that helps her rebound quickly, and the creativity, joy, beauty and sparkle of mischief and imagination that she shares with us through her designs. Thanks Nat!! The second Wylde Woman is Rosalie Quinlan. Rosie, too, has faced hurdles, the biggest being her brush with cancer - yet through it all, she has continued to encourage others to explore their hidden creativity, especially with her recent book, "Gift", which encourages us not only to NOT take our everyday gifts, like good health, good friends and loving family, for granted, but also to live every day to the fullest and to share that joy with others. Thanks Rosie! 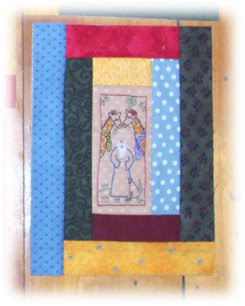 The third Wylde Woman would have to be Peg, from Happy in Quilting. 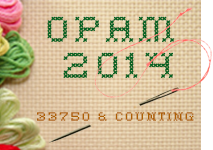 Now Peg inspired not just me, but hundreds of stitchers all around the world, to tackle some of their UFOs. That and the resulting organisation deserve an award to start with!! 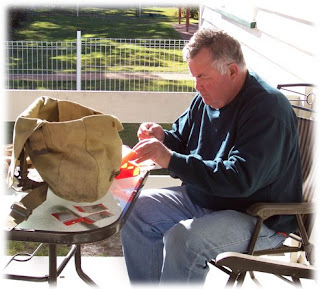 But Peg also opens her home and life to share with, and encourage other people to express themselves through stitching and it's all done with a generous heart and a spirit of fun. Thanks Peg! So ... I could go on and on, working my way through my list of blog favourites - not to mention a long list of non-blogging buddies who fill me with awe, admiration and inspiration. And do you know what that tells me? Scratch the surface of most 'ordinary' women and you'll find a Wylde Woman lurking there!! Tee! Hee! Hee! If you haven't visited the blogs of my wonderful, inspirational blogging buddies, I'd encourage you to do so - but I'd make a cuppa first, cos you're sure to spend a while enjoying their writing!! There's just one drawback that I've found with this award ... Suddenly, I have a song stuck in my head - don't know the name or who sings it, but the chorus includes the line, "Wild women do, and they don't regret it!" So ... I'm off to continue my Wylde Woman adventures - hope you do too!! Til next time - Bear Hugs! 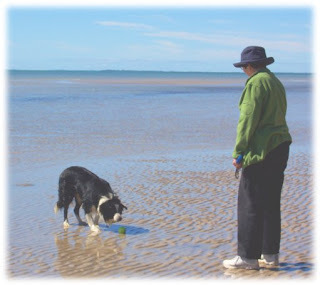 The only drawback was ... Dad and GB didn't really get much exercise walking to their fishing spot!! Tee! Hee! Hee! And Saturday was a perfect SPRING day for us, which sent GB off a-fishin'! Awww ... aren't they CUTE?!?! Tee! Hee! Hee! Even Lilly was worn out from all the fun on the beach. Sunday dawned just as bright and warm, so after we'd packed up and vacated the house by the appointed time, we headed for the beach, where Wombat and Lilly had a BLAST!! 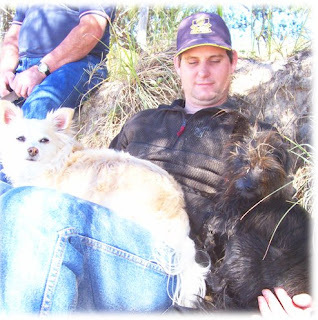 Mum's dog, Sunny, and Lilly decided to get comfy under the trees and GB was a handy human-bean-bag! Now, I also received a lovely, blush-worthy award from the Queen of Fairy Glitter, but I've waffled on so much about being WARM for the weekend, that I shall post about it next time. So until then, may your hot chocolate be full of marshmallows and your Kit Kat not melt on your fingers!! Bear Hugs! 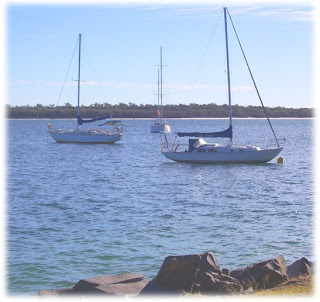 Well, you'll be incredibly surprised when I tell you it's another cold, blustery winter day here in Toowoomba - SIGH!! Very over it! Every time I step out the door, I feel like I'm being sucked into a giant vacuum and my hair gets tossed around so much that I end up looking like a dandelion! Not a good look!! Only 17 more days til Spring - sure hope someone's alerted Mother Nature to that fact so she turns off the cold and turns the warmth on at the right time!!! If only it worked like that! Pretty silver sparkly paper and cute ribbon! I almost didn't want to give them away, but I was a good girl and toddled off to the post office, where I think I bought a few more shares in Australia Post and had my eardrums ruptured by a child attempting to break the sound barrier!!! Eeek!! So ... there will be some goodies landing in mail boxes in the next week or so and the best part is, some of them are late and some 'just because' so most of the recipients will be unsuspecting! Tee! Hee! Hee! Love sending surprise gifties!! 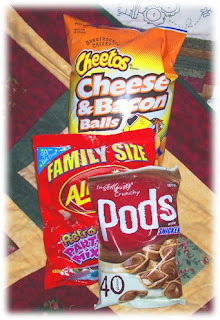 Can't go travelling without munchies!! Just ask Sharon at Red Geranium Cottage, she'll agree!! So, all we need now is for my beloved Geek Boy to be allowed to leave work. He was originally supposed to have today off so we could have a long weekend, but with one other person from the Multi-media Department off on holidays, his boss got all ... BOSSY! ... and said that as the Manager of the Department, GB has to be responsible and forfeit his day off. GRRRRRRR!! Not happy, Jan!!! So, we were then hoping he might be able to take an early mark, but he just sent a text to say 5pm finish it is. SIGH! Ah well, a late night drive is not unusual for us, I suppose!! And we will enjoy the time away, so ... I guess that's the go! I promise to take some photos to post when I get back. So ... really, today has been all about packing and getting ready to go away, though I did have time for a chat-via-email with my bloggy buddy, Lilly Linda. We're cooking up a little something for later in the year which will be very exciting ... but it's all secret squirrel for now while we work out some details, so stay tuned!! 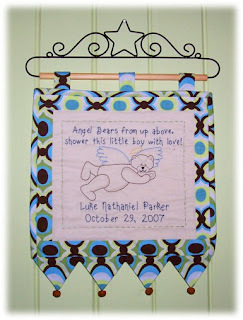 Oh, and you really need to visit the Lilly Cottage blog to see photos of the adorable new addition to the Lilly family!!! And whatever you're up to this weekend, I hope you enjoy some time with family and friends - I know we will!! Til next time - Bear Hugs! 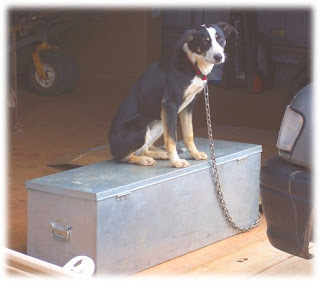 Now I know it's really a tool box she's sitting on, but you can see why it made me think of that dog on the tuckerbox!! Her name is Tessa and she belongs to Tony, one of my workmates. And she wasn't just sitting on the 'tuckerbox' so she could become a symbol of iconic Australian cultural music, (I don't think?!?!) you see, it was a cold, overcast day (yet again!) today on the Darling Downs and this tool box had been sitting outside long enough to soak up the few rays of sun that managed to creep through the clouds - so it was WARM!! Smart puppy!! 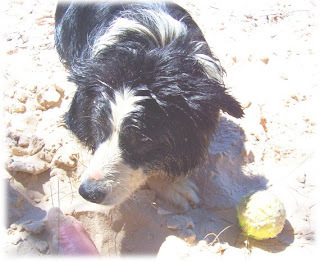 You can see why Border Collies are considered one of the smartest dog breeds in the world - although how our not-too-bright Border Collie, Wombat, fits into that category I'm not too sure!!! And speaking of Wombat ... I have a couple more photos to show you. Here's my beloved Geek Boy wondering why I'm taking photos and Wombat plotting a quick get-away!! It took GB almost as long to clean up the bathroom (we don't have a laundry tub that's accessible or big enough to get Wombat into and it was too cold to stand him outside - apparently!!!) after the dog bathing as it did to bath the two of them (Lilly was actually pretty low-fuss and went first!) 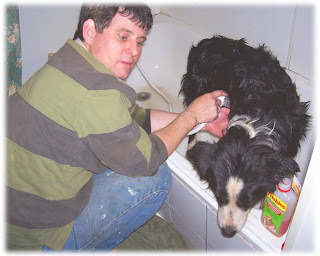 and when he'd finished, GB reckoned he's collected enough dog hair from the plughole, walls, floors, every flat surface (and a few bumpy ones!) in the bathroom, to make another dog! 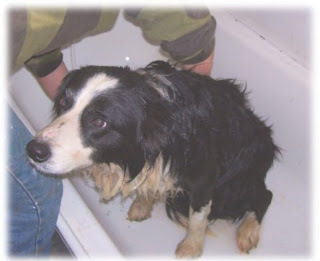 However, both dogs were clean and shiny, though a little fluffy from the hairdryer (don't look at me, I stayed out of it!!!) and they smelled much better than usual - for at least half an hour before they found something decomposing to roll in!!! SIGH!! Who needs kids!!! 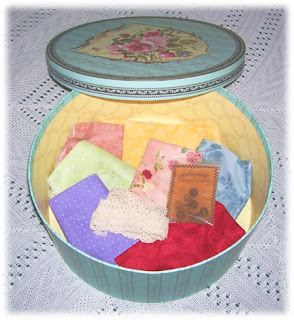 Hmmm ... shabby chic fabrics, pretty cotton lace, rusty bells ... These are some pretties that may (or may not?!?!) 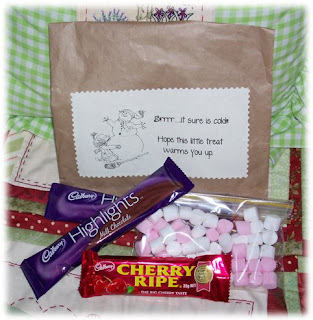 be included in the making of the surprise bag. Even if they don't get used ... they're pretty, aren't they! Tee! Hee! Hee! And you'll notice I'm using my birthday box to show them off. So, for more sneaky peeks, watch this space! 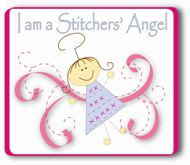 And whilst on the subject of swaps ... the Stitchers' Angel craft feature will get underway on Monday August 18, so make sure you click on the button in the sidebar to visit - it will be worth your while! Helen has gathered some of Australia's cleverest craft designers together (Helen herself, Natalie Lymer of Cinderberry Stitches, May Britt from Norway, Karen Gass of Cotton Spice, Lynette Anderson, Tracy of Plumcute Designs, and Sue Daley of Patchwork with Busy Fingers ) and they will be offering free patterns through her web site for the next seven weeks. 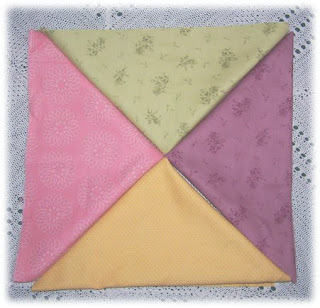 While some of us have also signed up for the swap part of the Stitchers' Angels, everyone is welcome to visit Helen's blog and download the free patterns. 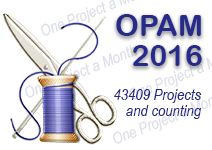 They will all be for projects relating to stitching, so will be perfect for Christmas or birthday gifties, so make sure you take a peek - and give Helen a Bear Hug from me!! Oh! And speaking of "Must Visit" blogs, make sure you pop over to Rosalie Quinlan's blog, she's having a giveaway of patterns for her FABULOUS new Christmas pattern - it's Christmasy, has red and white dots and stitcheries, so I just HAVE to win it, or I'll be adding yet another 'something' to my "Must Have" list!!! So, I'm off to play with some fabric to see what I can come up with for my swap bag - right after I toast myself in front of the heater for a few minutes to thaw out!!! Brrrrrr!!! Arctic winds blowing again today and I can't feel my nose or toes at the moment!!! Hope you're cozy, warm and enjoying some stitching! Til next time - Bear Hugs! Hmmm ... when I see that photo I suddenly realise I haven't been quite as slack this year as I thought I had been. What a nice discovery to make! Now if only I could cross a few more things off my "To Do" list!!! Ah well, baby steps!!! 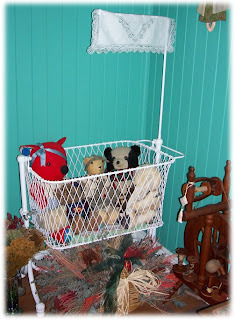 I love this cradle for a number of reasons. 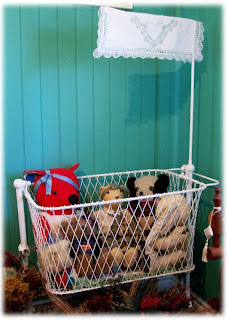 The first is that I just love vintage cots, cradles, prams, trikes etc. The second is that, despite being a 'non-collector', my Mum bought this for me for my birthday a few years ago. The third reason is the cradle's history. 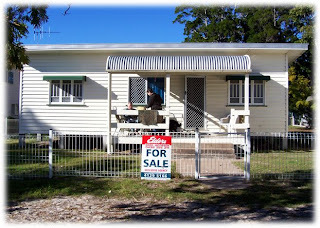 You see, a friend of Mum's bought the cradle at auction when the old Mundubbera hospital and lots of associated equipment, was being sold off to make way for the new health care facility. When none of her three daughters were interested in restoring the cradle, this lady sold it to Mum for my birthday present. 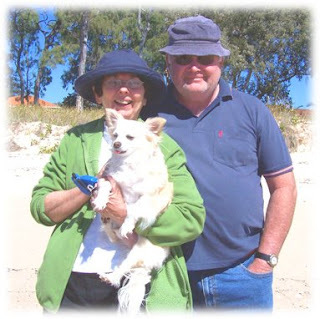 This lady passed away suddenly a couple of years ago, so this is a nice link to her and her friendship with Mum. 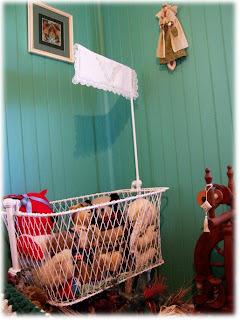 And it's also special, because my little bro was actually born in the old Mundubbera hospital building in 1973 and Mum said he slept in a cradle like this one - perhaps it was this very one!! Or not!! But you can see why it has a lot of semi-mental value for me. Plus, it's a really cool place for some of my bearbies to snooze the days away! Tee! Hee! Hee! 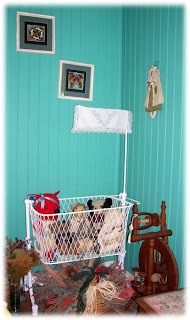 So, there you go, Jo Jo - photos of one of my vintage cradles! There's a timber one in our bedroom, but it's yet to be restored, so I'll save that for some future date. The other thing I did this morning (I was on a roll!!) was to make a start on the bag I need to make for Linda's Bag/Bucket Swap. Since it's a secret squirrel swap, all I can tell you is ... I traced a stitchery!!! Tee! Hee! Hee! So I'm now off to curl up in front of a DVD and stitch. No ... not the Olympic broadcast, a DVD! Granny Loz and I are starting the "Non-Olympic Watchers Anonymous" support group, for all those of us who are more worried about losing the viewing of some of our fave TV shows to the Olympic coverage! Tee! Hee! Hee! I know lots of you have been looking forward to this event, and don't get me wrong, I'm a patriotic Aussie who can "Oi, Oi, Oi!!" with the best of them ... I just don't enjoy the way the coverage is done. Plus, I have to confess I'd rather watch a good 'whodunnit' than a sporting event!! But, I hope those of you who are Olympic fans enjoy yourselves - just don't stay up too late watching, or you'll be too tired to stitch!! OK, really going to stitch now!! Have a fantasmagorical weekend, no matter what you're up to! Til next time - Bear Hugs! Uh oh! 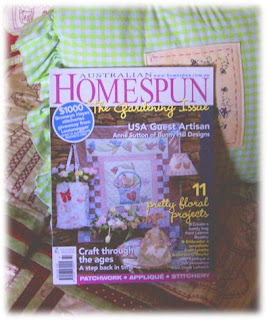 There go all my good intentions, cos the latest "Homespun" mag appeared in my mailbox and just had too many goodies to ignore! There's a gorgeous bag by Leanne Beasley, a cool lamp shade by Lynette Anderson ... need I say more?!?! All of my good intentions went out the window and I curled up for a little read. Then had to run some errands, and now I have a few minutes at home before ducking out again - oh I do lead such a busy social life!!!! Tee! Hee! Hee! I wish!! Right now, though, time has ticked away and I have to flit off and run some more errands. Hope you're all keeping warm and busy - unless, like me, the postie left you the latest issue of "Homespun", in which case, I'll sneak off now and stop disturbing your reading!! Til next time - Bear Hugs! No, no, I haven't frozen on the spot!! 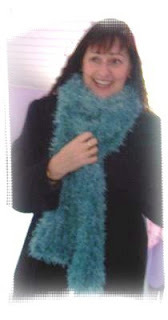 In fact, I was feeling rather warm over the weekend - which you may have guessed from the title! Now you've all read my moaning and groaning about the horrible cold and how much I hate being cold. Well, I think God got tired of me complaining and gave me a glimpse of what's waiting if I can hold out through winter for spring! After some particularly bitterly cold days earlier in the week, Friday dawned clear and WARM!! Yes!! The temperature climbed all the way to 25 degrees - I was a happy camper indeed! I had so much more energy than I've had for weeks - I think the blood could thaw out and circulate more efficiently! I even cleaned the bathroom, a job I put off at the best of times, but especially when the cold temperatures make playing in water even more unattractive than usual!! 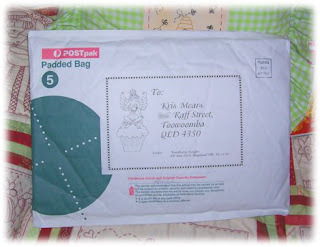 A care package from my blogging buddy, Kerryanne! Oooooohhhh! What a SWEETIE!! I wonder what's inside?? Tee! Hee! Hee! 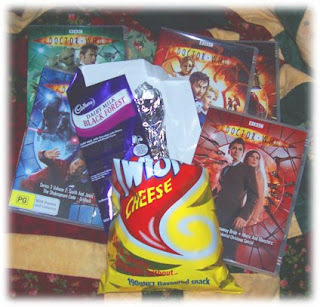 We enjoyed a "Dr Who-athon", complete with chocolate and chippies!! Add to that lots of cuppas (I had some yummy hot chocolate sachets, after all!!!) and chatting until the early hours of the morning and you're getting the picture of how we spent our relaxing weekend!! So by Sunday afternoon when Deb went home to get ready for a new week, we were both feeling very relaxed and mellow. GB, on the other hand came home weary after the cold woke him up at 5am (there are reasons I don't go camping!!) and without catching ONE fish! You see, it's been so cold that there have been mass deaths amongst the more delicate fish species at the dam they travelled to and the fish left alive, were staying deep where the water was warmer! I have to say, GB wasn't too worried about not catching anything - he enjoyed laying in the sun and catching up on his Nanna-naps, he said!! 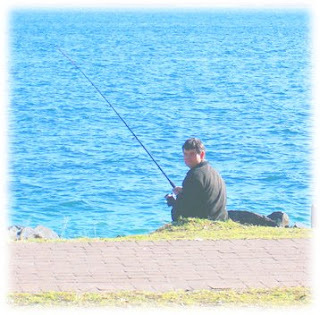 Fishing is usually just a way to stop me nagging him about sitting doing nothing!!! Hmmm, I'll remember that!!! All in all, a lovely weekend was had by all and sundry. Now I know I've been complaining about my "To Do" list growing, but I couldn't resist adding to it on the weekend when I signed up for Chookyblue's Secret Santa Christmas Swap. If you're wanting to join the fun, you'd better be quick, cos poor Chookyblue has been inundated with sign-ups and she'll be closing off soon! I'll be adding the logo to my sidebar in the next day or so. 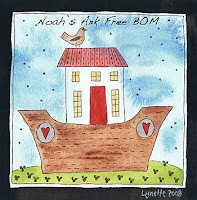 And speaking of logos on my sidebar ... it's time to click on Lynette Anderson's Noah's Ark BOM logo in my sidebar, as she's added the latest block for downloading. This month's critters are ... Mr and Mrs Giraffe! Hmmm, they'd probably enjoy the scarves I've been knitting!! Tee! Hee! Hee! I've printed off my copy of Lynette's latest fun block design, just have to get brave enough to go into the sewing room to do the prep work so I can stitch in the warmth of the lounge room ... Maybe tomorrow! After I have a hot chocolate to fortify me against the cold that came back with a vengeance after the weekend!! Whatever you're up to, whatever you're stitching, stay warm and I'll be back on the same Bat-channel for the next episode of my continuing adventures! Til then - Bear Hugs!